Congratulations to the Society for Classical Studies upon the celebration of its sesquicentennial. 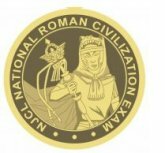 We salute the 2018 recipients of the Society for Classical Studies Precollegiate Teaching Award—Susan "Magistra" Meyer, who teaches at Culbreth Middle School in Chapel Hill, North Carolina, and Thomas "TJ" Howell, who currently teaches at Northampton High School in Northampton, Massachusetts. Read their citations and beam with pride for our profession. Kudos to the 2018 recipients of the Society for Classical Studies Award for Excellence in Teaching of the Classics at the College Level—Monessa Cummins of Grinnell College in Iowa and Mike Lippman of the University of Nebraska-Lincoln! These citations will also warm your heart. The name of this winery speaks for itself. 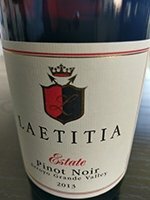 In vino Laetitia? Certainly Wilfred Owen would not chuckle at this, nor probably would Horace. Thanks to Judith Hallett for sharing. You, too, can feast like a Minoan. Learn how. Photo of "Hall of the Colonnades" at the Palace at Knossos. Courtesy of Wikimedia Commons, Creative Commons 2.0. 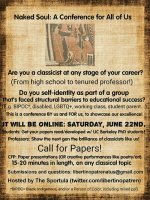 The group of classicists who have formed The Sportula as a means of assisting students with microgrants will be sponsoring an online conference dedicated to inclusivity. Note that abstracts for presentations are due March 15. Follow The Sportula on twitter. Cindy Caltagirone and Don Sprague are hard at work planning the ACL Centennial Study Tour of Rome with an optional add-on tour to Campania. So, mark your calendar for ROME2020ACL100 in July of 2020! ROME202 Awaits . . . 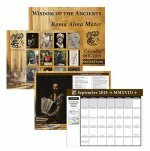 The 2018-2019 Roman Calendar is in the mail If you were not on that mailing list, the calendar is available as a download. We also have copies available at conferences. If you would like to be included in the 2019-2020 Roman Calendar mailing please submit your request. If you have suggestions for webinars, please contact Don Sprague. All of us at Bolchazy-Carducci Publishers wish you, your families, and your students a wonderful 2019! May your classrooms buzz with active learning! May your students thrive! May you feel empowered and impactful! All of us at B-C at this time renew our pledge to do our best to provide you with the best service and materials to serve you and your students. In the KUDOS section, may I direct you to the Society for Classical Studies Precollegiate Teaching Award citation for recipient TJ Howell. TJ and Ted Zarrow's webinars for B-C on active Latin have been among our most popular webinars. We have finalized the schedule for the spring and invite you to dismiss the late winter and early spring doldrums by attending a webinar. We're especially pleased that Daniel Gallagher, the Ralph and Jeanne Kanders Associate Professor of the Practice in Latin at Cornell University, will join an engaging group of webinar presenters over the next couple of months. Check out the new schedule. This is a momentous year for classics in North America as the American Classical League celebrates its centennial and the Society for Classical Studies celebrates its sesquicentennial. Plan to attend the centennial ACL Institute this summer in New York City. We look forward to seeing you there! Wishing you many moments of joy and your students many "aha" moments this year! In recent years, I have heard a great deal about the use of gamification as a motivator in the classroom. A couple of months ago, I read about a website called BadgeList.com that allows a user to create a customized set of badges. It occurred to me that this site could be used by a teacher to develop her own system of gamification. The user registers for a free account and creates what is called a "learning group." Within each learning group, the user can create multiple badges. Each badge has a name, a brief description, and an associated image. In addition, the system allows the user to specify what evidence must be submitted in order for a student to earn the badge. Once the teacher has created the learning group and associated badges, she can add students to the group either via an email invitation or by sharing the link. As students develop the skills and knowledge necessary to earn a badge, they can submit evidence for review and the teacher can either award the badge or provide follow-up feedback. Getting started with this type of gamification requires some thought as to how to break down the curriculum into discrete chunks and how to assign each chunk as a badge. I like the idea of having badges for the different skill sets that we focus on in our classes. To get started, visit www.badgelist.com. 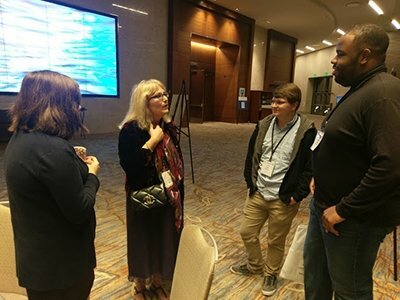 World class cuisine, the jazz scene, and a beautiful cityscape drew over 8,000 language teachers, specialists, and curriculum directors to the annual meeting of the American Council on Teaching Foreign Language (ACTFL) held November 15–18, 2018. Don Sprague represented Bolchazy-Carducci and staffed a booth in the exhibit hall. 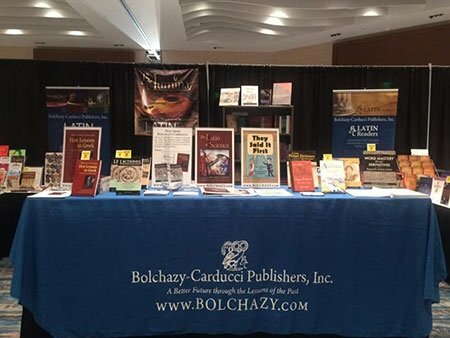 The American Classical League, National Latin Exam, and National Junior Classical League sponsored the booth next to Bolchazy-Carducci's—which generated steady traffic. Latin teachers themselves as well as their kind language teacher colleagues and department chairs who wanted to bring something Latin home to their Latin teacher colleagues were especially keen to purchase Latin buttons and copies of the I Am Reading Latin and I Am Reading Latin Stories series as well as Ubi Fera Sunt and Arbor Alma. Latin teacher participation in ACTFL continues to grow—around one hundred Latinists attended and ten presentations were given by Latin teachers. The American Classical League's centennial celebration reception drew some seventy enthusiastic attendees who enjoyed libations, tasty noshes, and the camaraderie of classicists. 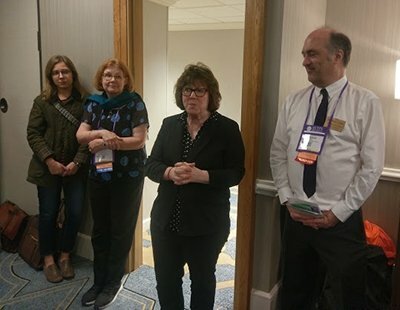 A highlight of the reception was ACTFL's Martha "Marti" Abbott's greetings to her colleague classicists. The former Latin teacher served as ACTFL executive director from 2011 to 2018 and previously for eight years as director of education. Ed Turner was awaiting his flight at the New Orleans airport on Sunday when he received word that he had won both student and teacher versions of A Latin Picture Dictionary and Word Mastery through Derivatives as the prizes for the B-C ACTFL 2018 drawing. Ed Turner, classics instructor at The Hill School in Pottstown, Pennsylvania, won the Bolchazy-Carducci Publishers drawing at ACTFL 2018. 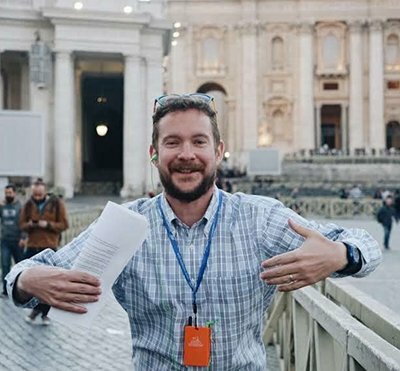 Surely his joy at learning of his winnings matches that of the photo taken in the Piazza San Pietro! 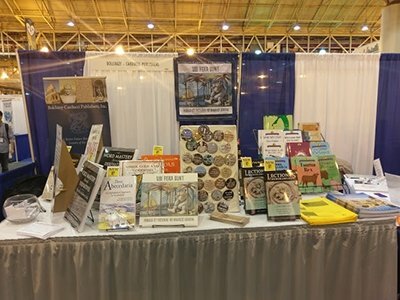 An ACTFL booth tests an exhibitor’s facility at maximizing the limited space available for displaying books and other learning materials. ACTFL executive director Martha Abbott, flanked by ACL president Mary Pendergraft and ACL executive director Sherwin Williams, greets attendees at the American Classical League reception to celebrate the organization’s centennial. 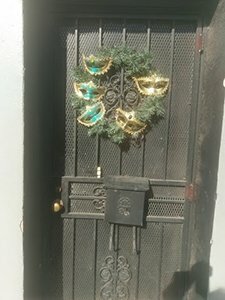 The wreath on the door is representative of what makes New Orleans special. 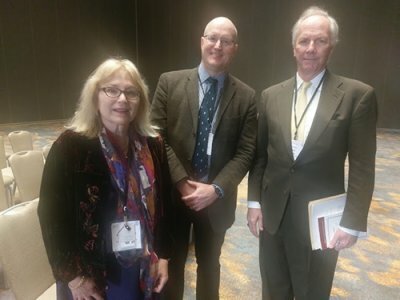 President Bridget Dean joined editors Don Sprague and Amelia Wallace for the annual meeting of the Archaeological Institute of America (AIA) and the Society for Classical Studies (SCS) at the Marriott Marquis and its marina in San Diego. Held January 3–6, 2019, the meeting drew some 2,200 attendees from across the country. 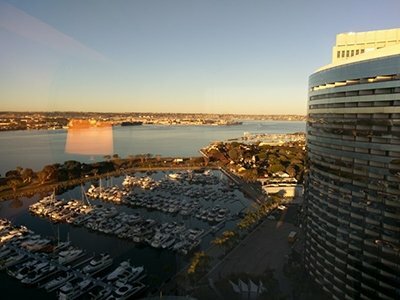 While San Diego was a bit chillier than anticipated, its sunshine was most welcome, especially to attendees who had to endure flight delays due to winter storms in other parts of the country. 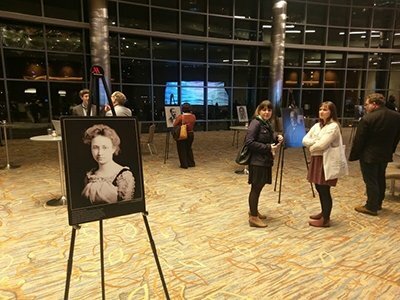 The Bolchazy-Carducci Publishers exhibit extended across two exhibit spaces near the exhibit hall’s open central space with seating for one-on-one or small group conversations. Wide aisles and the size of the hall gave visitors to the exhibits a sense of spaciousness that encouraged lingering and paging through titles. The booth opposite B-C's housed Lithodomos VR, an Australian company founded by a classical archaeologist. Lithodomos specializes in providing virtual reality tours of archaeological sites. Visitors to their exhibit "oohed and aahed" as they experienced 3-D reconstructions of various Roman sites. These good neighbors, Tony Simmons and Simon Young, shared their humor and their passion chatting with us. With three editors staffing the booth, each editor was able to attend a panel presentation. Bridget Dean and her brother Benjamin Buchholz, who lives near San Diego after his service with the US military, attended several archaeology presentations. Buchholz is a writer whose works include poetry, short stories, the novel One Hundred Nights, and the nonfiction book Private Soldiers—both books inspired by his service in the Middle East. Amelia Wallace was energized by the panel "What Can 'Active Latin' Accomplish?" (sponsored by the American Classical League and organized by Ronnie Ancona and Justin Slocum Bailey). Don Sprague attended the Special 150th Panel—From APA to SCS: 150 Years of Professional Classics in North America, organized by Matthew McGowan. In his opening remarks about the presenters, McGowan noted that panelists Michele Ronnick and Ward Briggs had written the introduction and preface respectively to William Sanders Scarborough's First Lessons in Greek: A Facsimile of the 1881 First Edition. Ronnick spoke about "African American Members of the Society for Classical Studies: A Census of Affiliations (1875–1938)" and Briggs presented on "Opening the Gates: The American Philological Association/Society for Classical Studies 1970–2019." It is with sadness that we report that the AIA/SCS meeting occasioned two incidents of racism. The B-C editors did not personally witness these events and so we refer you to the Chronicle of Higher Education report and the response of Princeton Assistant Professor, classicist Dan-el Padilla Peralta, AIA/SCS panelist whose credentials were verbally assaulted, also published in the Chronicle of Higher Education. Bolchazy-Carducci Publishers encourages our profession as it seeks to more vigorously address the issues of racism and privilege in the discipline and to work at being more inclusive. All three Bolchazy-Carducci Publisher representatives raved about the view from their hotel rooms. The B-C display showcased the company's new and forthcoming titles. 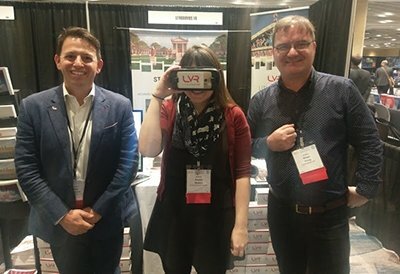 Editor Amelia Wallace—flanked by Lithodomos VR principals, CEO Tony Simmons and Founder, Executive Archaeologist, and Business Development Europe, Dr. Simon Young—explores 3-D reconstructions of Roman sites with the company's special viewfinder. Matthew M. McGowan, who organized the Special 150th Panel—From APA to SCS: 150 Years of Professional Classics in North America, poses with fellow panelists Ward Briggs and Michele Ronnick. Michele Ronnick, organizer, shares her insights with some younger classicists at the 15 Black Classicists: A Photo Installation on Friday evening. A view of the 15 Black Classicists: A Photo Installation. The exhibit is on view at the Center for Hellenic Studies, Harvard University, Washington, DC, until March 2019. Loyola Marymount's Matt Dillon poses with his winnings from the B-C book drawing—Lectiones Memorabiles Volumes III and IV, William Sanders Scarborough’s First Lessons in Greek: A Facsimile of the 1881 First Edition, and Three Abecedaria. Timothy Joseph, Associate Professor of Classics at the College of the Holy Cross, offers some reflections on Martin Luther King, Jr.'s connection to the ancient Greeks. Teachers can share this with classes for the MLK holiday or during February, African-American history month. The Landmark Caesar provides a wealth of material for teachers looking to enhance their knowledge of Caesar. Both the print book and the additional essays available online present a breadth of current scholarship on Caesar. 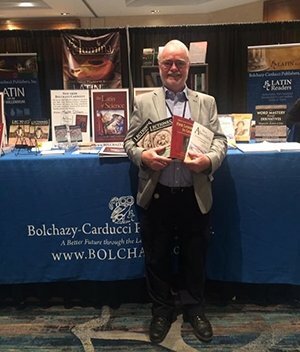 Bolchazy-Carducci author (A Caesar Workbook with Rose Williams) Debra Nousek contributed “Caesar, Man of Letters,” “The Gallic War as a Work of Literature,” and “The Cultural Legacy of Caesar's Commentaries” to the online collection. 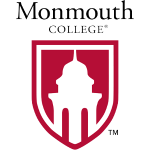 Dr. Nousek will be presenting “Caesar: Man of Letters” as a B-C webinar on February 5, 2019. • Do check out the Bolchazy-Carducci roster of webinars for Spring 2019. • The Open University is offering a course on medicine in ancient Greece and Rome. 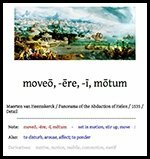 • An excellent discussion about active Latin and translation. • Learn about England’s beloved Kennedy’s Latin Primer. • What evidence do we have for the Roman practice of crucifixion? • Check out how scientists have reconstructed the face of a Bronze Age woman from Scotland. • Bronze Age regicide may be world’s oldest known political murder. • New excavation brings unique Egyptian tomb to light. • One person's junk is another person’s treasure. Thames River find finds British Museum home. • Roman cavalry helmet is found in Britons’ Iron Age shrine. • Did the Romans trade with Sri Lanka? The forum at Pompeii with Vesuvius in the background. Courtesy of Wikimedia Commons. • Drones help us learn about Pompeii and Mt. Vesuvius. • Pompeii excavations discover military commander's horse. • Forbes Magazine showcases Pompeii in the news of 2018. • Dental debris leads to reappraisal of skilled artists and gender in the Middle Ages. • Fun facts about Hadrian's Wall. • The New Yorker highlights the value of ancient Greek. • Does the techie world value the liberal arts? A great resource for the Latin classroom! A great prize for a certamen winner! This offer is valid for up to ten (10) copies of book, prepaid, no returns. 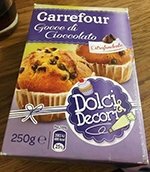 Discount is not available to distributors. Enter coupon code eLit0119 on the payment page. The special offer pricing will be charged at checkout. Offer is nontransferable and subject to change without notice. Bolchazy-Carducci Publishers professional development webinars are offered on Tuesday evenings 6:00-7:00 p.m. Eastern Time (5:00-6:00 p.m. Central Time). Webinar participants will receive a certificate of participation for professional development credit. 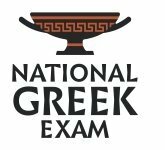 This webinar will demonstrate how all three levels of Latin for the New Millennium prepare students for the expectations of the AP Latin curriculum. This presentation will show how various activities and exercises at each level provide the skills and knowledge that ladder students to AP Latin in fourth year. While addressing this specific aspect of LNM, the webinar will also serve as an introduction to the LNM program. Professor Nousek is a Caesar devotee who has extensively researched, presented on, and written about him. 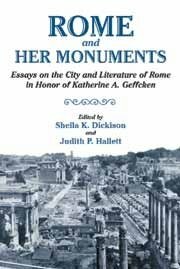 Her most recent delineated below focuses on Caesar as author. This webinar will be a great learning experience for all teachers of Caesar and especially those who shepherd their students through the AP Latin curriculum. The foremost authority on Scarborough, Professor Ronnick has passionately advocated for the publication of the African American classicist's autobiography and a collection of his works—for which two books she provided the introduction, annotations, and editing—and, most recently, for the reprinting of his First Lessons in Greek, originally published in 1881, for which she wrote the introduction. Professor Ronnick will discuss Scarborough's life and achievements, their historical context, and their implications for today. Professor Gallagher's webinar promises to be an illuminating presentation on Latin pedagogy. Gallagher will address such issues as "What is the role of conversational Latin in the classroom?" 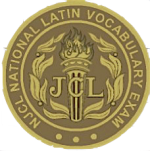 "What is the ultimate goal of the Latin classroom?" Gallagher is both an engaging presenter and a thoughtful educator. Participants will leave the webinar with some healthy reflection on their own teaching. This webinar will discuss approaches to teaching courses and topics about ancient medicine. Professor Goyette will outline some of the readings (in translation), methodologies, and assignments he has used in teaching ancient medicine courses, as well as possibilities for incorporating ancient medical texts into other kinds of courses. He will provide an overview of three sample lessons he has used to engage students in interactive discussions of ancient medical practices and ideologies. Considering the ancient Hippocratic Oath alongside later medical oaths, the Hippocratic treatise 'On Dreams', and the ancient Chinese medical text ‘'Huangdi Neijing', these lessons will respectively demonstrate strategies for analyzing the development of medical ethics from antiquity to the 21st century, ideas for connecting ancient medical texts with students’ lived experiences, and models for drawing cross-cultural comparisons between "Eastern" and "Western" medical traditions. Goyette will show participants around the open educational resources website which he has created for teaching ancient medicine. For complete webinar descriptions and presenter bios visit our webinar page.